If Guests are Star Wars fans … they shouldn’t miss the Star Wars: A Galactic Spectacular Dessert Party at Disney’s Hollywood Studios®. 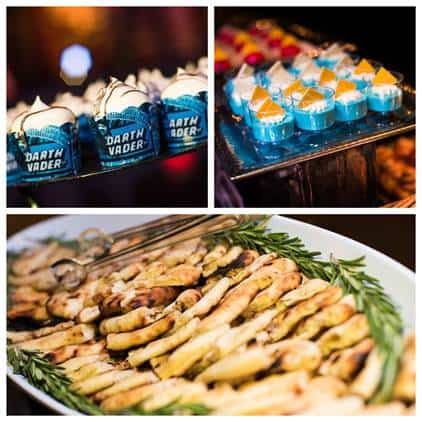 The party begins at Star Wars Launch Bay, where Guests will enjoy an out-of-this-world selection ofStar Wars-themed desserts, drinks and other tempting treats. For sweets, there’s the Blue Milk Panna Cotta with crispy pearls, chocolate Darth Vader-themed cupcakes with peanut butter icing and Raspberry Mousse Domes just to name a few! And on the savory side, there’s cheese, charcuterie, roasted red pepper hummus, black bean dip with sriracha sauce and smoked sea-salted flatbread. Non-alcoholic beverages are available. And for Guests 21 and over, there’s the Lightspeed Margarita, as well as beer and wine selections. 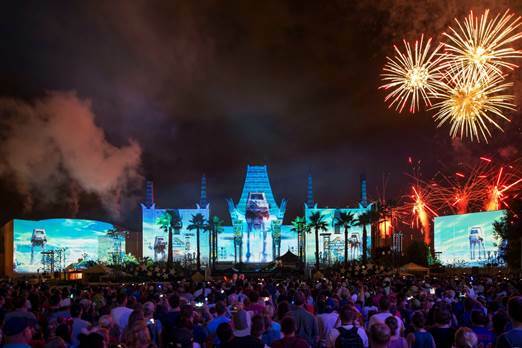 Following dessert, Guests are escorted to an exclusive reserved viewing area to watch Disney Movie Magic (a projection show featuring favorite Disney films) and Star Wars: A Galactic Spectacular, which features state-of-the-art projections, lighting, lasers and pyrotechnics. To remember the very unique evening for a long time, Guests will receive a souvenir Star Wars novelty stein. The price is $79 per adult (age 10 and over) and $45 per child (age 3-9). Tax and gratuity are included.Disney’s Hollywood Studios admission is required and is not included in the price. Please note check-in takes place in front of Star Wars Launch Bay, located in the Animation Courtyard. Seating is available banquet-style, where Guests may be seated with other parties. If Guests are traveling with another party, they should request seating in advance as the location may not be able to accommodate all parties upon arrival. Guests must be 21 years of age or older to consumer alcoholic beverages. A valid form of government identification will be required to verify age. Disney Dining Plan entitlements may not be redeemed for this event. Entertainment is subject to change or cancellation without notice.